Sailing out of Darkness took me traveling beyond my expectations. Normandie Fischer has a way of writing that made me feel like I was moving through time with her characters as they went from place to place. The transitions between scenes, the way that we were in Sam's mind, or were watching her ... all of these were fluid and strong. I should probably start somewhere else, since when we first meet Sam she's home. She's living her life post-divorce and fallen into a relationship with an old friend that isn't good for her. He's not. The relationship's not. The friend's "ex" is definitely NOT. She needs an escape, and plans one. That's when we truly get to know Sam. And oh, how I wanted to be there with her. The scenes where Sam finds herself alone in Italy? Some of my favorites. The way she drank it all in, absorbed the culture, the language, the food and drink - have I mentioned I wanted to be there with her yet? Fischer's exploration of a woman experiencing a new world and way of life in a foreign country totally made me want to take a trip overseas. When Sam met Teo we can immediately feel the connection between them. We enjoy the coincidences that bring them together, but we also find ourselves feeling that there are no coincidences. Sorry, maybe that's an NCIS reference ... but sometimes it just seems so true and this story is no exception. Something else I liked is that we first meet Teo separately. Away from Sam. We're able to get a feel for him, get to know him on his own. Before we see him through Sam's eyes. And yet, we know. We anticipate what's to come. We feel their connection before they've even met. Fischer does a wonderful job of setting up their relationship, whatever it may turn into, in these early scenes. And you may have guessed that this book is also about sailing. I learned that our author spends a lot of time on the water. I could definitely feel that from the content. And I truly enjoyed those scenes. As a boat person I can relate to the way it feels to be out on the water with the wind in your hair, even though we don't have sails. There's little like watching the sun set on the water when you're out there with it. The colors. The smells. The way it makes you feel. I could appreciate all of that through Samantha. If you've read my reviews before you know I'm not one to give too much away. I prefer to let you decide if you want to pick up the book and hope you'll let the story unravel for you by itself. I try to give you just enough info to show you whether or not I enjoyed the read and leave the rest to you. Sailing out of Darkness was an enjoyable read. There's a lot more to the story after Italy. Sam's not quite-ex and his not-quite-ex have their own storyline at some point. I'll be honest, I didn't really want those scenes when they were happening. I found myself frustrated and ready to skim to get back to Sam. Ultimately I get why they were there. They had a little bit of mystery that I read into pretty quickly, and I did keep reading to be sure I found out if my guess was right. I'm not going to tell you that, either, though. The stories do come together. Sam returns home eventually. I kind of wanted her to stay in Italy, but that's not realistic. I mean, it's a book, so it doesn't have to be realistic, but when you're reading something and you feel you know the characters in the story well enough, you know when it would be completely out of character for them to do something like pick up and stay in Italy forever. And that would have been the case for Sam. Okay, I'd better stop before I give away too much. Let me know if you pick up a copy for yourself. I'd love to hear what you think. I can be the person you talk to while you're reading so you have someone to share your guesses with. I'm so glad to have found this post. I'm an avid reader and always looking for something new. And I'm especially pleased that you didn't give too much away so I can actually explore the book for myself. Oh, Andrea, what a blessing. A writer longs to have someone who gets her words. (I know you feel that way, because I've been reading some of your blog posts.) 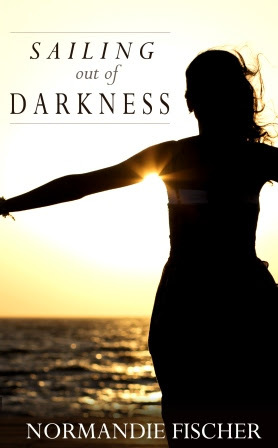 Thank you so much for reviewing Sailing out of Darkness. And, hey, readers can chat with me about their guesses too! So glad you like Tootie. She was a hoot to write--and, I agree, she and Rhea each deserve a book. I wonder where Tootie--or Rhea--could run to? I mean, a writer needs to do research, right? To travel. And as one NC gal who has lived elsewhere to another now-NC gal, I'd suggest a pause for coffee some place along the way. Intriguing review, I'll have to check the book out...tweeted! Great book. I loved it. "I can be the person you talk to while you're reading so you have someone to share your guesses with." I love having a friend I can share guesses with - what fun! Beautiful review, and I love your website. What a unique perspective you have. An excellent review without spoilers. Normandie is a wonderful author, wonderful sailor and wonderful person so this book deserves success. I hope your review brings t to her. There's always Sydney for that coffee! I am a big fan of Normandie's, loved her first book and now can't wait to read this one! Great review! I'm feeling all squishy after these lovely words. Thank you! And coffee in Sydney? Hmm... Too bad Sea Venture sailed in the wrong direction because I'd love to visit there. Andrea? You and yours headed west--way west--any time soon?